Last Wednesday, I caught the early train up to Newcastle-under-Lyme. My target – Cultural Squatters and a chance to see their cafe and talk to Narina and Mike about CounterCoins. As a concept, it is extremely interesting. The cafe was friendly and it was nice meeting everyone who turned up. You can read all about Countercoins below in an extract from my forthcoming book – British Transition Town Money. For now, have a shufty through the pictures (below) and enjoy! “In February 2007, Mike Riddell sat down with some friends including John Rogers (author of ‘People Money, the promise of regional currencies’) and started talking about alternative solutions to local problems. Ten years later, in 2017, CounterCoin came into being. Even today, it is still a scheme in the making, and plans are being developed as this is typed. The concept of CounterCoin is akin to a LETS rather than anything else, but there are significant differences. For a start, currency can only be earned into existence. There are fixed issuing schemes and, at the moment, few places to redeem the coins (such as a local major cinema chain). The rough concept is that five CounterCoins represents an hour’s work. However, when redeeming, there is no reciprocal sterling value. In some ways, the coins themselves have no value. The work earning them is voluntary, so has no monetary value. When they are spent, they take up (say) an empty seat in a cinema, which would have no value to the cinema if it stayed empty. “So, unlike most other forms of alternative currency, they do not represent actual pounds at any stage. The organisers hope that soon many other places will consider accepting them, including local buses and sports clubs. If a football club has empty seats for a fixture, is it better to accept hard-earned tokens, rather than let a seat go to waste? After all, ancillary spending, such as burgers, soon make up the profit. “As a trial, the scheme designed and produced acrylic tokens for their first issue in 2017. Their next project was a new community café which was trumpeted by The Guardian as a potential game-changer for decaying town centres, a place where the currency is hope. ‘Cultural Squatters’ café opened on 1 May 2018 as a ‘creative space’, complete with ping-pong parlour with equipment donated by Table Tennis England. The menu is cheap: coffee or tea is £1. A bowl of lobby with bread is £3, and a full fry-up with tea or coffee is £4. There is also a dog menu, with options including a dried pig’s ear for 30p or a sachet of Winalot for 80p, and finally, visitors can even participate in a workshop to design ceramic CounterCoins – the next leg of the journey. “This is the nub of their project’s uniqueness. ‘Cultural Squatters’ is staffed by volunteers rather than paid employees. They include people with all sorts of backgrounds and include adults with learning difficulties and people who have been unemployed long-term. Rather than being paid a wage they receive CounterCoins, which they can then exchange for good or services from other local businesses such as the bowling alley. Early in 2018, the team reckoned that being the heart of the potteries, it was more appropriate to make tokens in clay, and that is precisely what the 2018 issue comprises. Human Nature Escapes connect people to nature as a means to ‘escape’ – inspiring a sense of wellbeing. They are a ‘profit for purpose’ social enterprise – investing all profits back into serving the community. Check out what they say about Counter Coin. Innovative place-based regeneration specialists Hometown Plus today announced they have been awarded the Fairplace Award, the prestigious ethical workplace accreditation run by leading UK property charity, the Ethical Property Foundation. 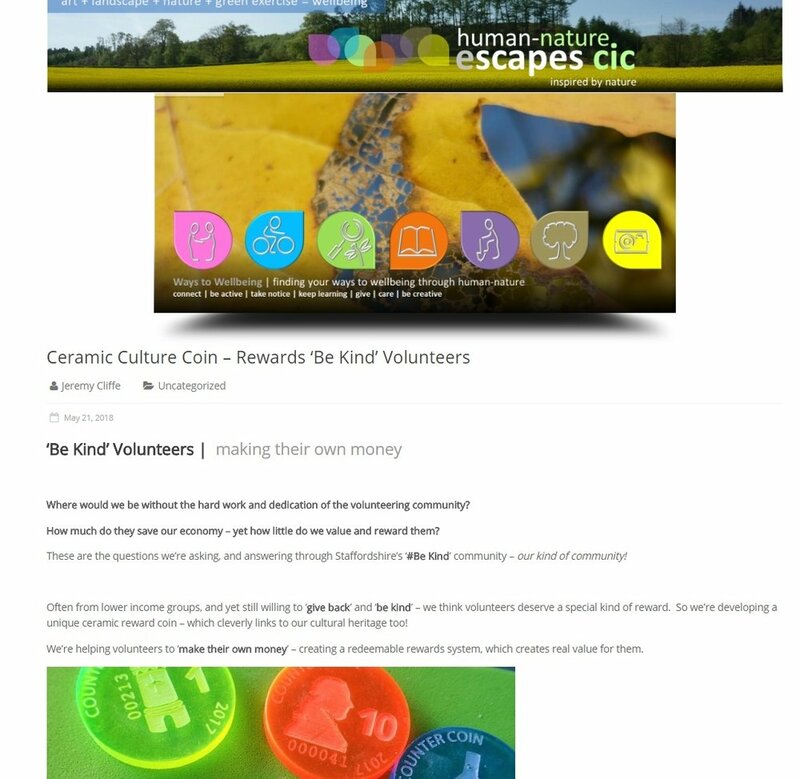 The project recently reached a further milestone by launching the centre's CounterCoins - a new currency designed by local young people that will be used as the catalyst to inspire people to volunteer at community and charity events, in return for rewards. For every hour volunteered, the volunteer will earn five CounterCoins with a total value of £5 - which can be spent at outlets within the town centre. All income from the Fairplace Award supports the charitable work of the Ethical Property Foundation which provides property advice to charities and community groups. The Foundation is preferred supplier of land and property advice to the Charity Commission. Facilities Management World magazine has featured York Place Shopping Centre in this article published last week. Every three weeks or so in the winter, the country looks to football for an FA Cup story. Not least because of the chance of glory for the little teams, the game's grassroots. Each year in the autumn, the gaming community embraces football with the launch of a new FIFA and it's associated fanfare. This season, The Gamepad in York Place made the most of an away draw at 'The Place To Be' to pull off a giant killing of its own. Several consoles and various sized screens were set up to allow Newcastle's FIFA fans to get in on the action before the game went on sale at midnight last Friday. While supporters of the bigger outlets were forced to queue all night at the turnstiles, local gamers enjoyed match day hospitality courtesy of the YMCA and Gamepad manager Paul Bradbury with the opportunity to play before the official release and purchase the product as soon as time allowed . Paul is already planning his next events; Star Wars Battle Front 2 in November and a Retro games night in December. He encourages anyone with ideas about running games nights to get in touch as he’s keen to build a gaming community in and around The Place to Be at York Place Shopping Centre in Newcastle. Would you like to join a new company board focused on facilitating and rewarding social action for community and business benefit? We'd like to chat possibilities with strategic and operational development work and a possible gift of shares in mind. Pioneering and resilient spirits with principles, values and a keen sense of social responsibility should definitely get in touch. HomeTownPlus’ Mike Riddell makes the case for the sharing economy to boom in its rightful home- the birthplace of the industrial revolution and the home of cooperatives; the North West. In Silicon Valley, San Francisco, billions of dollars have been poured into a handful of tech start-ups, most notably Airbnb and Uber – that have made their fortunes despite owning no hotels or taxis- but instead creating businesses based on people creating and sharing goods of value to them. The media were drawn to these organisations, and they soon became synonymous with the sharing economy. However, as the money rolled in, the communitarian element rolled out. Exploiting peer providers, purposely breaking regulations, strong-arming local governments, and unethical competitive tactics became the norm. The very thing that earned these start-ups traction in the first place — how they recast relationships between strangers in radically constructive terms — was sacrificed to growth. Instead, they became a particularly aggressive extension of business as usual. Despite these disappointing examples, the real sharing economy has not disappeared. The sudden explosion of this economy may have had its growing pains, but this new wave of creating wealth presents inventive and creative opportunities for Merseyside and Greater Manchester to become the world’s first city regions that develop a platform for sharing- where its citizens, governments and markets work together to promote sharing and the common good. Our city regions are in the best place to take advantage of an era-defining opportunity for us, once again, to lead the world in economic development. One that fundamentally transforms the way our people create value. We have increasing evidence of the positive outcomes that a sharing economy approach can produce to revive a dying shopping centre in Newcastle-under-Lyme and are identifying sites to roll out the approach here in the North West. Imagine an economy based on solidarity. An economy that is future-proofed through car-sharing, bike-sharing, crowdsourcing, crowdfunding, co-working, co-housing, open government, participatory budgeting, hackerspaces and more. It doesn't have to be an idealistic view of how society can work, it is happening in pockets across cities - we just need to make sure the people who can lead this change come together. For some this has worked well – they have been able to embrace the changes around them and make them work to their advantage. Many of our cities, for example, have been transformed by a combination of the concentration of digital and other businesses, investment in infrastructure and a revival of inner city living. But there have been huge swathes of the population for whom the change has damaged much of what they value and who now feel that they have been abandoned by society and government alike. Nowhere has this manifested itself more than in the old industrial heartlands, where more often than not the townsfolk were reliant for employment on a small number of large businesses, now long gone and unlikely ever to be replaced. The community was often built around these industries and this too withered away simultaneously. The position has been exacerbated by the decline in town and shopping centres, previously thriving community hubs, but now hit hard by a combination of under investment, increased popularity of online shopping and the pull of large out of town shopping centres. These towns have also seen in some cases an influx of residents for whom the area is not their historic hometown and who have yet to establish a sense of belonging. So today the Britain we see is one of contrasts – not just between the affluent South East and the rest of the country, but also between the cities which are forging a new and bright identity and the towns which have been left stranded in their wake. If this situation is not addressed as a matter of urgency, the gap will get still wider. The cities with their bars and restaurants, employment opportunities, excellent public transport and inner city housing will continue to attract those with money and talent whilst the towns will continue in the downward spiral which has left their centres derelict, job opportunities non existent and a large proportion of the population disaffected, disenfranchised and disillusioned. Hometown Plus exists to redress the balance – to help the communities fight back, recover their identity, re-establish themselves and to help put local businesses and the general public back on the road to sustainable prosperity. Find out more about our work to generate sustainable change for all stakeholders.